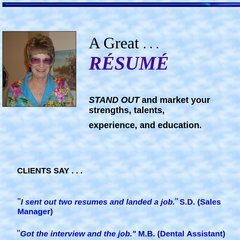 Topics: Resume Styles/formats, Key Words, The Process, and Editing/updates. It is written for ASP.NET language. There are 2 Nameservers, ns01.domaincontrol.com, and ns02.domaincontrol.com. It is hosted by Godaddy.com Inc (Arizona, Scottsdale,) using Microsoft-IIS/6 web server. PING (64.202.163.112) 56(84) bytes of data.